Well, you simply can’t avoid them. They are everywhere.. and they will find you, no matter if you speak English or German. So, look into the face of your two worst enemies in this article: To be and to have in German. Statistically, these two verbs are the most common ones in both languages. You simply need them when you “want to have a coffee”, or “when you are sad”. Apart from that, they are of high importance when you want to form different kinds of grammatical structures. Please, try tp keep “to be and to have” in German in mind! As I have already mentioned these two verbs appear really frequently and have an important role as auxiliary verbs. In the following, we will clear up what “to have” and “to be” in German actually mean and in which grammatical constructions they are used. By the end of this lesson, you’ll be able to express your state of being, as well as what you have, with ease! Well, we will start learning something about the verb “haben” (to have). Actually, it is a little easier than “sein” (to be), as it has a simpler conjugation. Of course, “haben” is the infinite of the verb. In the following, we will discover its conjugation in different tenses and further of the verb to have in German. So, here is its conjugation in the present tense. For sure, you could observe that the verb to have in German has the stem “ha” and changes its word endings depending on the person. Its different forms are actually quite regular – so, if you want to refresh your knowledge about word conjugation, have a short look at our article about German verbs! Well, the forms of to be in German are a bit more difficult than the ones of to have. Here, we are talking about a irregular verb. So, there is no real rule that you can follow to understand the conjugation of “sein”, you simply have to learn and memorize its different forms. Now, as we have cleared up the basic forms of “haben” and “sein”, you should know when to use them. Generally, it is quite similar to the use of “to have” and “to be” in English: First, if you want to express possession, you should use to have in German. Second, if you want to express feelings or emotion, you can use “sein”. And without loosing too much time, I want to show this table, where you can see their conjugation in the past tense. We will start with “haben”, as a more regular verb. Of course, you can clearly see the word stem and the regular changes of the word endings, depending on the person. Unfortunately, the conjugation of “sein” remains irregular. Here you have the table showing them. Well, we have completed the forms of “to be” and “to have” in German in the past tense. As in the present tense forms, “haben” has regular forms, whereas “sein” is still irregular. So, you simply have to learn these forms by heart. 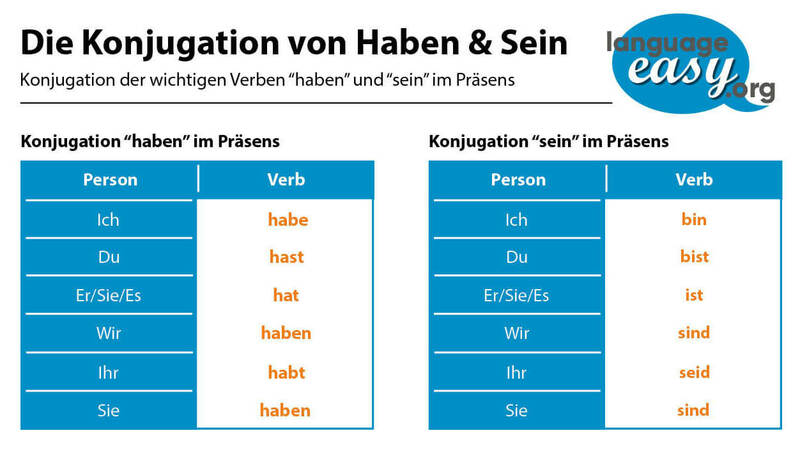 Now, we have reached a tense where you can see the importance of the different forms of “sein” and “haben”: You need it every time you want to form verbs in the perfect tense. So, let’s start right ahead with the forms of “haben” in perfect tense. Actually, “sein” works the same way. The form of the present tense works as an auxiliary verb. So, let’s have a look at the forms of “sein” in the perfect tense. the past participle of “sein”, “gewesen”. Wir haben eine Party gehabt. This follows the same rules as when using these forms of perfect tense of to be. Finally, we will learn the forms of to be and to have in German in fourth most common tense in German. So, let’s go straight to the different forms. In contrast to the sections before, we will start with the forms of “sein”. So, for the forms of to have in German in the future tense, we will need future tense forms of “sein” as an auxiliary verb. Here you have the table of its forms. Actually, the future forms of to be and to have in German are not so complicated, as they are really similar to the way it is formed in the English language. Well, I hope I could clear up things for you – to be and to have in German are not as difficult as you might think. Put a lot of elbow grease in studying them, especially the irregular forms of “sein”. They are a crucial element of German grammar, as they are also for the English language. 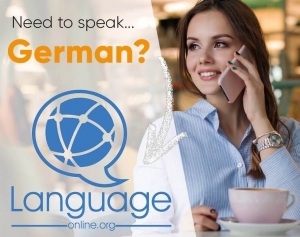 By the way, if you want practice the use of to be and to have in German, enter this website where you can find great interactive exercises.